RPF SI Admit Cards/Call Letter for PET, PMT Events, Certificates Verification 2019: Railway Protection Force, RPF & Railway Protection Special Force, RPSF) has released the call letter/Admit Cards for PET, PMT and DV for Group F Sub-Inspector posts. 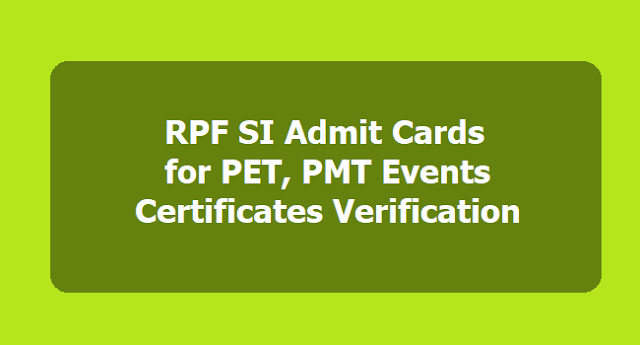 Candidates who will be appearing in these tests can download the call letter from the official site of RPF at rpfonlinereg.org. The examination dates have not been released. Candidates who will appear for Physical Efficiency Test & Physical Measurement Test and Document Verification will have to download the call letter by following these simple steps. Step 1: Visit the official site of RPF at rpfonlinereg.org. Step 2: Click on SI link. Step 3: A new page will open where candidates will have to click on ‘Call letter for PET,PMT and DV’. Step 4: Click on Group F link. Step 5: Enter your registration number and date of birth and click on login. Step 6: Your call letter will be displayed on the screen. Step 7: Download the call letter and keep a hard copy for further need.